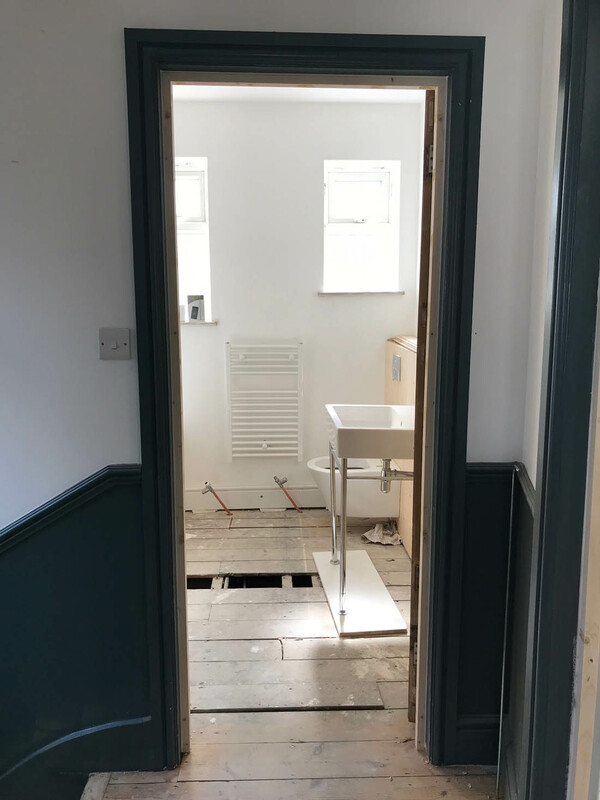 We have just started week seven of the renovation and so I need to update you on week five and six. Week five was crazy! Jules was at the house all week sanding the floors so he could send me update pics every day and with every photo things changed so much and so quickly! 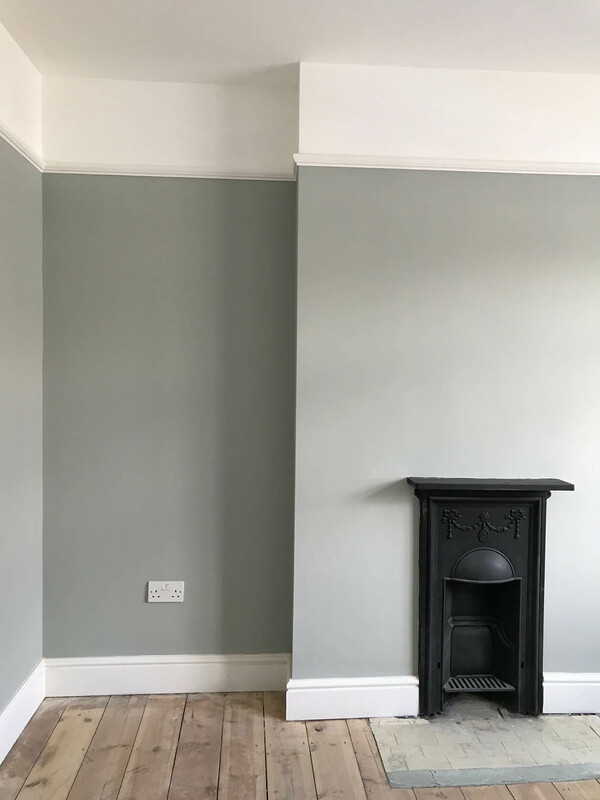 The radiators went in, the lights went in and on, the picture rail, coving and dado rail went up, the doors came back from being dipped and were fitted and the whole house was painted. I mean, that’s a lot in one week, right? Painting is almost done and I’m thrilled with the colours. 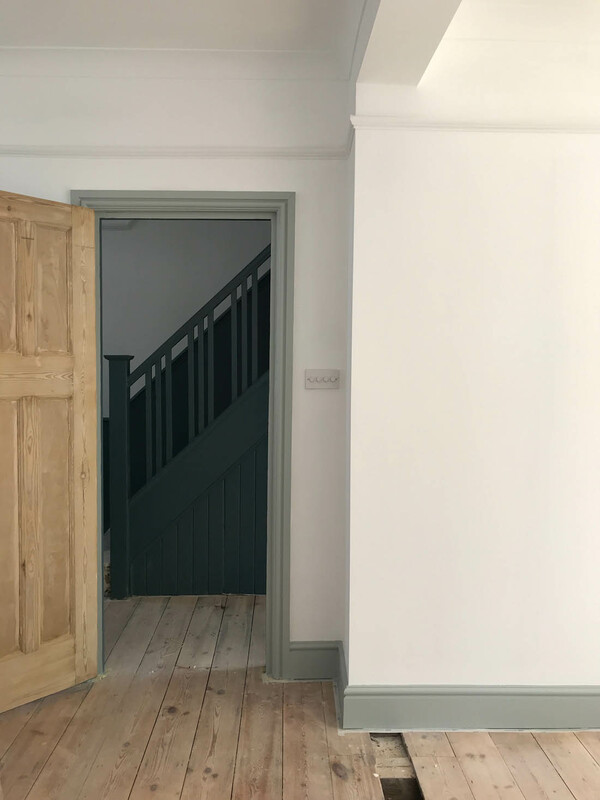 The hallway is painted in Inchyra Blue and the woodwork throughout the downstairs is Light Blue, both by Farrow & Ball. The downstairs walls have all been painted white and this has made the space feel so much bigger. 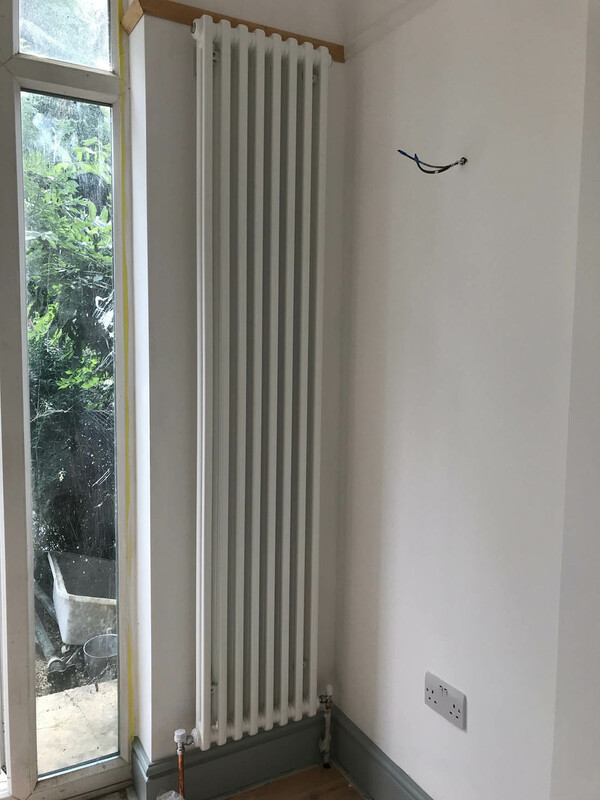 The radiators are in and I’m so pleased we went with column radiators. This vertical one is by Myson from PlumbNation and fits really well in the space next to the French doors. The natural wall space for a radiator vanishes when you knock down so many walls so this is a good solution and it’s so slimline I barely notice it. I have bought wall lights for the alcoves that just need to be fitted. The picture rail, coving and dado rail all went up during week five and they have made such a difference to the feel of the space. 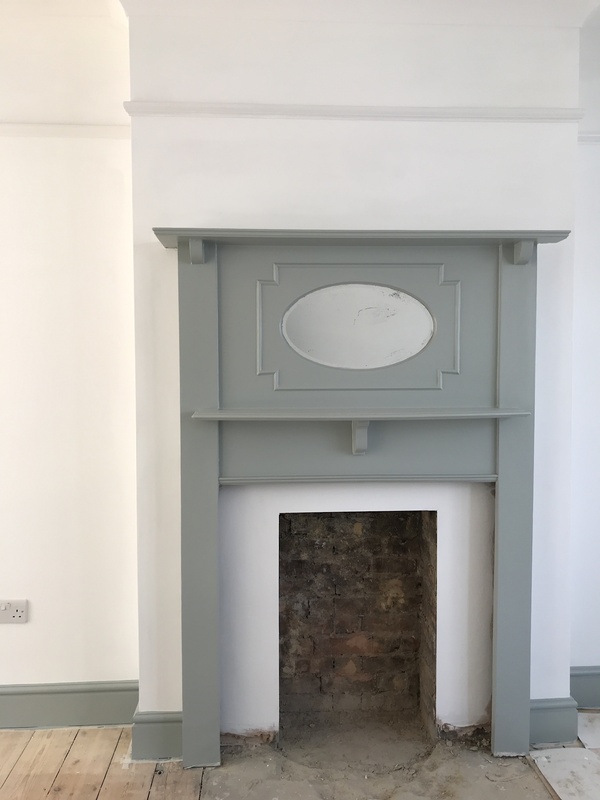 The original 30s fire surround that I bought is fitted now and has been painted by mistake- I had said I wanted it white. What do you think? Keep it this colour or go back to white?? We will tile it on the exposed plaster and the hearth. I love how the hallway is looking. 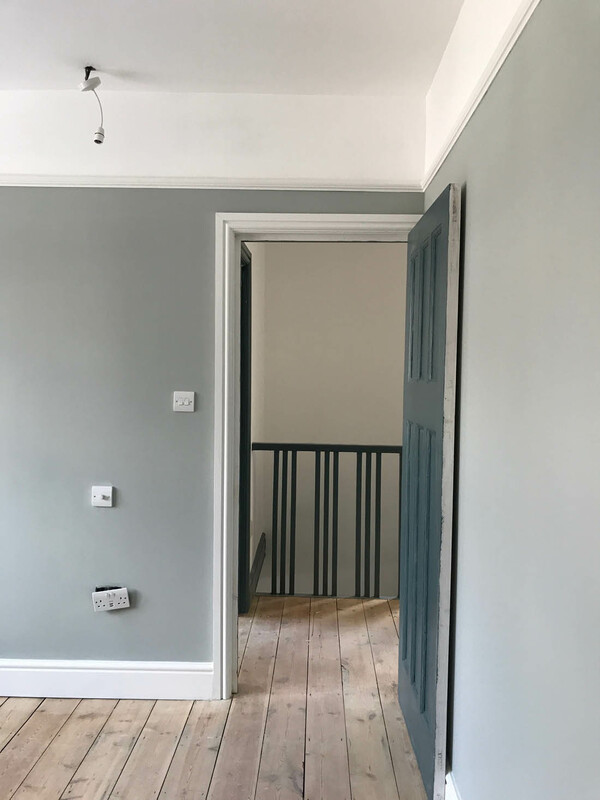 The walls below the dado rail are painted in Inchyra Blue Modern Emulsion, which has a slight sheen and is more hardwearing than Estate Emulsion. I’m hoping it will be wipe clean for dog mud and baby hand prints. All the wood work is Modern Eggshell and we have left this side of the doors in natural wood. 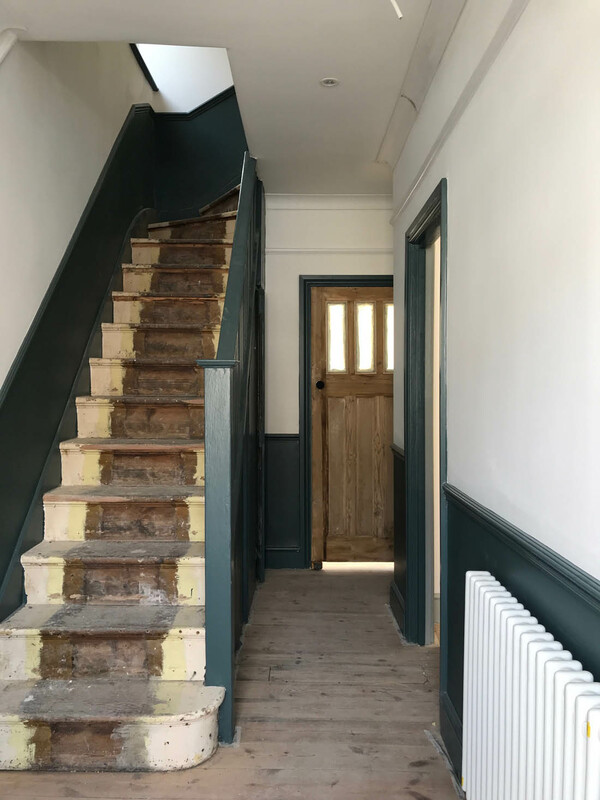 We still haven’t quite decided what to do with the stairs (we can’t afford to carpet them at this stage) and the radiator needs to be painted to match the walls. Our bedroom is painted in Light Blue by Farrow & Ball and the fireplace has been sprayed with matt black paint. The lights are all ready to go – we will change the light fittings, these are just to test it is all working. This is Mimi’s room and the woodwork is Light Blue and you can see how our doors turned out after being dipped. 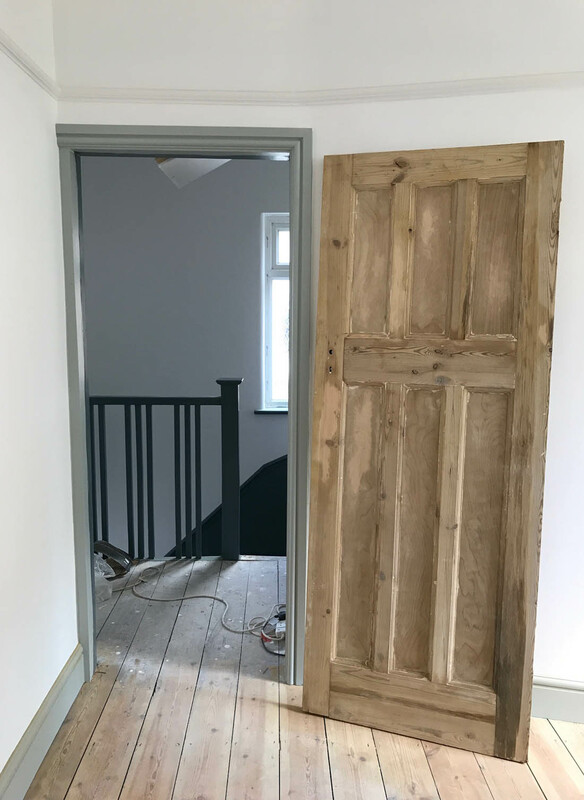 All the doors have now been fitted and we have left some natural wood and painted others. My next post will show you more of what is happening in the bathroom. Hi Katy, I love what you have done so far! It is so nice to see how you bring back the period features in the modern setting! But why are you thinking about carpet on the stairs and upstairs? You have such nice original floorboards, covering them up would be such a shame. Plus, it is just the loveliest feeling to walk around barefooted on wooden floors. We have scattered rugs in every room, which was super cozy during winter. It’s looking fabulous Katy! I love your decision to go with Light Blue woodwork all around the downstairs, it looks brilliant, especially with the glimpse of Inchyra Blue in the hall. I would leave the fireplace as it is – I think it is a lovely feature, though of course it depends on the tiles you had planned as to whether it will work. But at the moment it’s beautiful. Looking forward to seeing more. Leave the fire surround, I think it would just blend in with the white walls otherwise & be lost, like this it is now a statement? Your house looks amazing! Can’t believe how quickly it’s coming together. I think you should keep the floorboards upstairs too, though a sisal type carpet might be nice if you did decide to cover them. I also think the radiator in hall is fine unpainted & your fireplace is lovely as it is. Love your colour choices, and mix of white with some colour & natural wood. And your bathroom looks great so far, can’t wait to see more! Definitely leave the fireplace…..I agree with Anna…….it would just be lost if you painted it white. I think you should also paint the hall radiator to blend with the wall. Love Farrow and Ball colours! Can’t wait for bathroom reveal…that’s what I’m considering next. This looks so good Katy. Were the dado and picture rails original to the house, or have you had them put back in? 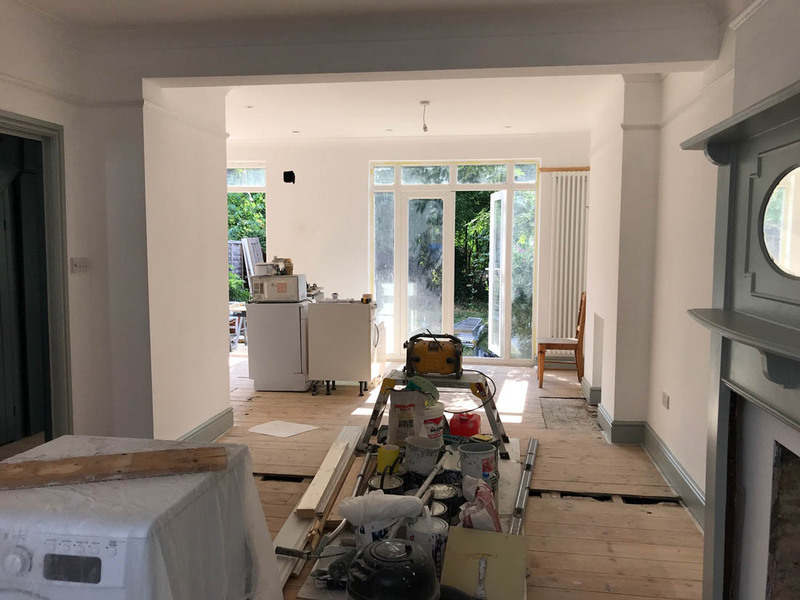 Our late-20s terrace was completely stripped of all features, and I’m thinking of having them put back in – if anything, I feel they help proportion the rooms a bit better. 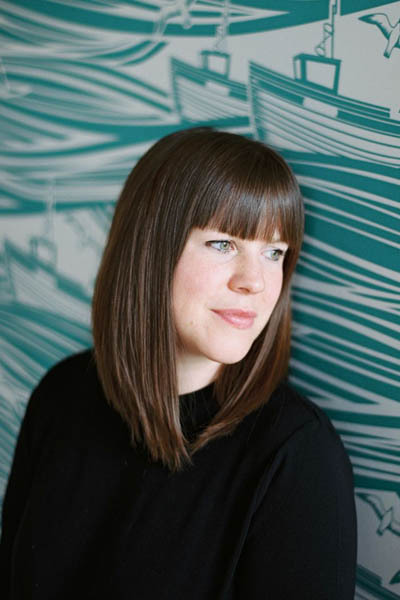 I’m also liking the wipe-clean factor – one child and dog later, and our walls are a mess! ah, just seen your previous post about adding character back to a period home! disregard my comment! (I’m catching up on my blog reader, in reverse order! ).